Although the name may suggest it is next month, Oktoberfest is up and running. 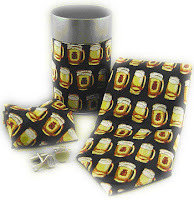 If you are planning a visit to the popular festival, why not dress up for the trip with this Beer Tie, Hanky & Cufflinks Gift Can Set. If you are a fan of beer it will come in handy again in the future, assuming you don't spill too much down the tie!